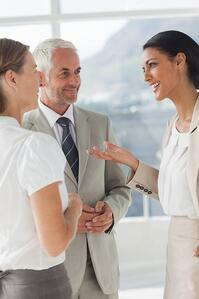 For most people, networking is the number one reason to attend an event. But creating new contacts can sometimes feel puzzling and/or intimidating. How do you make the most of your time, energy and budget? What’s the right way to approach someone you’d like to meet? Read on to get 21 networking event tips for every stage of your next event. Arrange to stay in the hotel that the organizer recommends. Doing so will allow for easy participation in social activities — it’s likely that the fellow guests and speakers will also stay there. You have a lot of ground to cover in little time. Prioritize which booths you want to visit, which sessions you want to attend and who you want to meet. Events move quickly, especially as you are moving from one session to the next. If there is a presenter you are interested in, take the time beforehand to come up with a plan that ensures you are able to connect at the session. Who do you want to meet? Have you read their latest work? What do you think about their company’s mission? Do you follow them on social media? If so, are there any interests you have in common? It always helps to hit the ground running. If you like a speaker or fellow guest’s work, let them know. Express your sincere interest via email or social media, and let them know that you’d love a few minutes of their time to introduce yourself (remember, it’s a good idea to start with a shorter meeting). 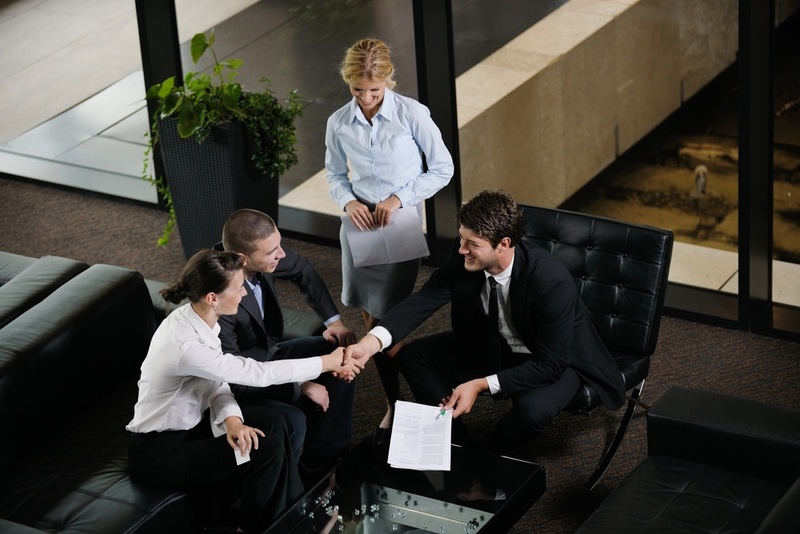 Reach out to your event organizer to better understand which activities or social events will be pre-planned. Be sure your name is on every list you need it to be on. Let’s face it, talking to strangers can be awkward. It can’t hurt to consider a few simple yet thoughtful questions to get a conversation moving beforehand. If you feel a little anxious or don’t know how to begin, remember that everyone is in same boat. Commit to getting the most of your time and just go with it. 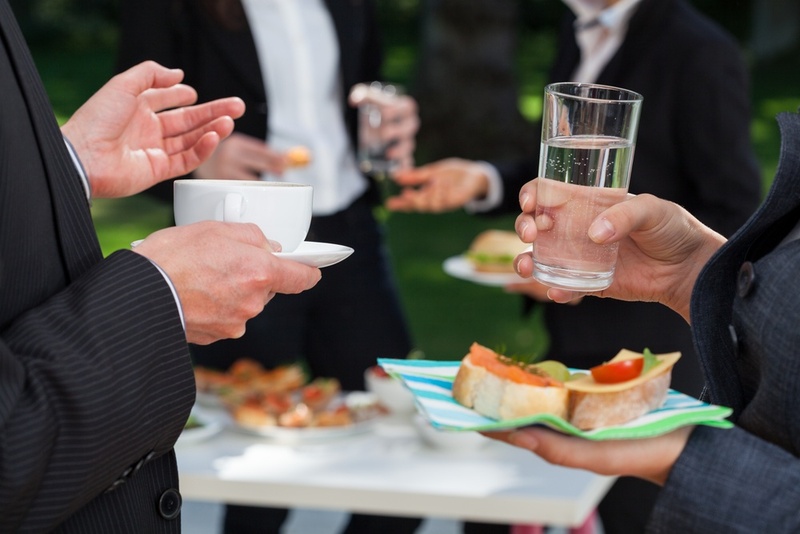 Lots of great conversations start at planned receptions and shared meals, so don’t miss out. If there aren’t any pre-arranged activities, have dinner at the hotel bar. You’re likely to run into other attendees. Try to collect as many as you can and if you’re the type to easily lose them, take a quick photo with your phone. 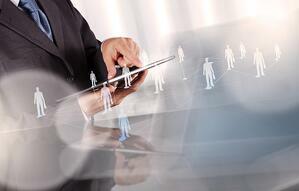 Apps are key for networking at an event. Take advantage of all the features that can supercharge your networking, whether its matchmaking or social feeds. Gluing yourself to the one person or clique that you already know is easier, but it won’t get you as far. Try to be as open as possible. If not many people approach you, remind yourself that most people are looking for someone to talk to — they’re trying to navigate the same waters as you. Don’t hover around the side of the pool. Dive in and make the first move! If you spot someone you’d like to talk to, it’s a great idea to open with “Hey, you’re (name) from (specific company or author of specific book/blog)!” Let them know why their work stood out. “I loved your article about…” We all love to talk about our passions and our work and this breaks the ice. While it can be good to have a few bullet points about yourself, a memorized pitch could take the wind out of your sail. People prefer in-the-moment honesty and sincerity. The way you convey your message will depend on whomever you’re speaking with. You’ll build a different rapport with a mommy blogger than you would for a finance CEO. Really listen and express your curiosity with genuine questions about people and their projects. Giving your peer or new contact the chance to talk while you listen is also a nice way to ease into the conversation. We have all felt stuck in conversations we want to leave. Always be polite and courteous with your exit — but get out at the right moment. On the flip side, if you’re in a group and see someone you know or someone who looks interested in joining, don’t hesitate to invite them in. 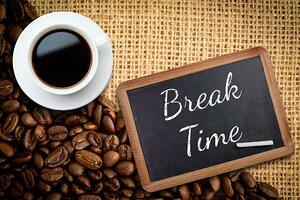 Breaks are the perfect time to strike up a conversation but events can also be quite exhausting. Take a few minutes to recharge if you need it. Don’t forget to take advantage of talking to sponsors — it’s the reason they come to the events! Stand out by visiting sponsor booths and striking up a conversation. Make sure you have access to anything you might need to secure a contact and to feel comfortable: business cards, notepad and pen, mobile device, mints, comb, eye drops and water to stay hydrated. This is a no-brainer. Many events and receptions offer alcohol. Don’t ruin a networking opportunity because you’ve had too much to drink. There will be plenty of time to let loose after hours or next weekend once you’re back home. Making connections and friends at a conference can be really fun. However, too much work talk can also be a bit stressful. It’s perfectly okay to talk shop to the degree that you’re comfortable with and also encourage some general fun! Be yourself and enjoy yourself. Don’t drop the ball by forgetting the follow-up. Make it a point to connect to contacts and speakers soon after. It’s a good idea to reference specifics from the speech or your conversation. Once you’ve done a great job with your networking, keep the momentum going. Mobile event apps truly take the work out of networking by providing suggested matches along with details about that match and conversations starters to make conversations easier. If you are an event professional looking for more information about next level attendee networking with a mobile app, check out this post. Or contact us to schedule a demo.